We are proud to offer a wide selection of chiropractic services at our clinic. Chiropractic care focuses on treating the musculoskeletal and nervous systems and helping people improve their overall health. At Mapleview Chiropractic Centre, our services are typically used to treat complaints such as neck pain, back pain, joint pain, and chronic migraines. 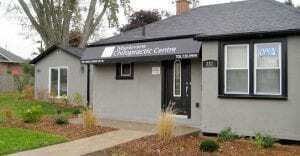 Serving the Barrie, Ontario area, our chiropractic clinic offers a wide selection of services to our patients. One of the primary treatment methods we perform is known as a chiropractic adjustment. During this process, our chiropractor uses their hands or a small instrument to apply a sudden, controlled force to the spinal joint. The purpose of a chiropractic adjustment is to correct the misalignment of your spine and ultimately improve your body’s physical function overall. Coming to our chiropractic clinic for an adjustment is highly beneficial if you have recently suffered from an injury, and it can also be used as a consistent method to ensure your body is always operating at peak physical performance. Activator Versus Manual Adjustments – Which is Right for You? Much of the fear associated with a chiropractic visit is caused by an uncertainty of the “popping” or “cracking” noise associated with a manual adjustment. What many people don’t know is that chiropractors can utilize many different tools to help achieve your best alignment, and a manual adjustment is an option, but not the only answer. Not only do chiropractors have special tables that allow them to position your body more easily and accurately during an adjustment, but they also have a tool called an “activator” that applies the necessary pressure to adjust misaligned areas without hearing the “popping” or “cracking” sound associated with a manual adjustment. There are many years of scientific research to prove that activators are just as effective as manual adjustments when it comes to chiropractic care. Used in conjunction with the latest technology, an activator can help your chiropractor target specific areas of misalignment to help you get better results with every visit. Even professional athletes benefit from chiropractic adjustments using an activator! Some people prefer only one method of adjustment, manual or activator; however, your chiropractor may be able to customize your adjustment depending on your preferences. For example, you may like a manual adjustment on your lower back but prefer the activator for your head and neck. At Mapleview Chiropractic Centre, we will work with you to help you achieve whole-body wellness using the tools and techniques that make you most comfortable during your visit. Contact us today to learn more about the benefits of using an activator during your next chiropractic adjustment. At Mapleview Chiropractic Centre, we look forward to introducing you to the benefits of chiropractic care and helping you achieve your goals for health and wellness. Our services also include massage therapy, custom orthotics, sports injury rehabilitation, and ultrasound therapy. Contact us today to schedule an appointment! At Mapleview Chiropractic Centre, our chiropractic clinic proudly serves residents of Barrie, Innisfil, Angus, Midhurst, Oro-Medonte, Thornton, Orillia, and Alliston, Ontario.